The city of Seville is a Spanish, capital municipality of the homonymous province and the independent community of Andalusia. 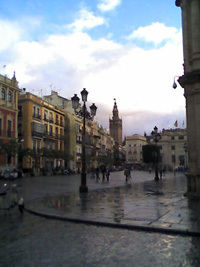 Seville counted in 2007 with 699,145 inhabitants according to the population census, being the fourth city in Spain by population, after Madrid, Barcelona and Valencia. The municipality has an extension of 141.31 km2s. The metropolitan area of Seville is also the fourth in the country, with 1.450.214 inhabitants (NSI, 2007), which represents a 77.5% of the total of 1.871.399 inhabitants in the province. The old part is one of the most extensive in the Old Continent, with approximately 335 has., about three kilometers in length by two in width. Its historical and monumental patrimony and the diversity of its cultural and scenic spaces, turn it into a welcoming city both for the national and international tourism. Some of its most representative monuments are the Giralda, theCathedral, the Alcázar, the Archive of Indias and the Tower of Gold. Some of them declared Patrimony of Humanity by Unesco in 1987. The Fine Arts Museum in Seville is the most visited in Andalusia and the second most important pinacotheca in Spain. Despite of being some 80 kms distance of the Atlantic Ocean, the guadalquivir river is navigablefrom its outlet in Sanlúcar de Barrameda all the way to Seville, the size of the boats that reach the city being limited by the conditions of navigability of the river. Seville is equipped with a wll developed road and railway system, as well as with an international airport. The historical presence in the city of the aeronautics industry, of the shipyards, as well as the war industry is very remarkable. On the occasion of the celebration of the latinamerican exhibition in 1929, the city underwent an important city-planning development marked by the construction of parks and buildings planned for this event, like the Park of Maria Luisa and the Plaza de España. The World’s Exhibition in 1992 meant an important improvement of the infraestructure, mainly in the communication by railway (AVE), airplane and highway. Also, new technology companies and University Centers have been emplaced in some of the released grounds of the Expo. Nowadays important proyects are carried out in the city, like the Cajasol Tower, the Parasol Metropol of the Encarnation, the Tube, Puerto Delicias or the New World Aquarius. Seville University, with more than 55.000 students, is one of the biggest in Spain. Also, the Pablo de Olavide University -in the old municipality of Dos Hermanas- counts with more than 10.000 thousand students who register in Erasmus programs and Spanish courses.